While we still have a very long way to go before electric vehicles are "the norm," Google is already one step ahead of most. 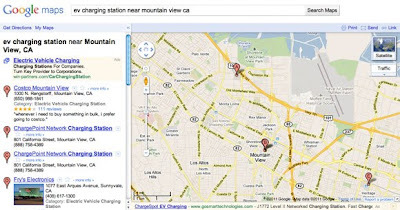 The company has just added a network of electric vehicle charging stations to Google maps, which will enable those with EVs to more easily find stations to recharge their cars. It's a vital addition to Maps, and it should be a best friend to those who are tired of driving in circles to find charging ports. To use the new feature, just search for “ev charging station” plus the appropriate area, for example, “ev charging station near mountain view ca.” Google's working hard to make even more data available; as of now, only a portion of all stations are listed, but they'd rather get something out now than wait. Also, the U.S. Department of Energy’s National Renewable Energy Laboratory (NREL) are working to make more data available. What's nice is that Google is actively reaching out to automakers and charging station builders in hopes of retrieving even more data.